If you're thinking of planning a trip to Hersheypark in Hershey, Pennsylvania but you're not sure where to stay, The Jersey Momma is here to help! Here's my honest review of the Hershey resorts. 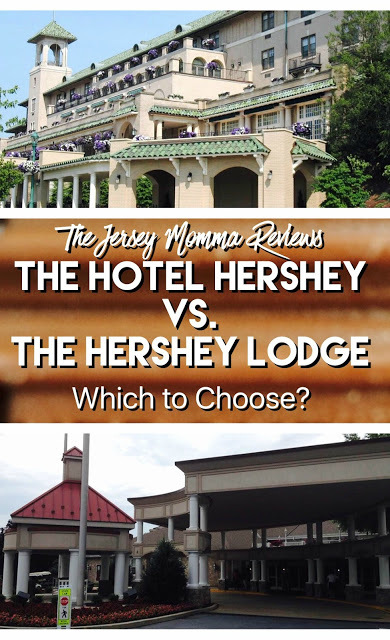 You can also read Part 2 - The Hotel Hershey vs. The Hershey Lodge, which highlights the Hotel Hershey. *FYI: I was NOT compensated in any way by Hershey or these hotels. I am just sharing my honest opinions with you 'cause that's how I roll. I can't tell you which choice to make for your family, but I can tell you what I experienced at each one, and hopefully, this will help you decide! This post is chock full o' info, but it's designed for easy reading with bold headings you can scroll through. For even easier access, Pin the below image for later! -cabanas at Hersheypark Boardwalk are available first to property guests (if you are willing to shell out the buck$$ for them!). Non-guests can reserve them, too, but resort guests get priority reservations. We just returned from a super fun night at Hershey. And NO I was not compensated for my stay or asked to review the hotel in exchange for anything (although I would be happy to oblige if you want me to give you an honest review of your establishment! Hint, hint!). Also keep in mind that my review is of Hershey Lodge during the month of June, so experiences may differ for you during different seasons. 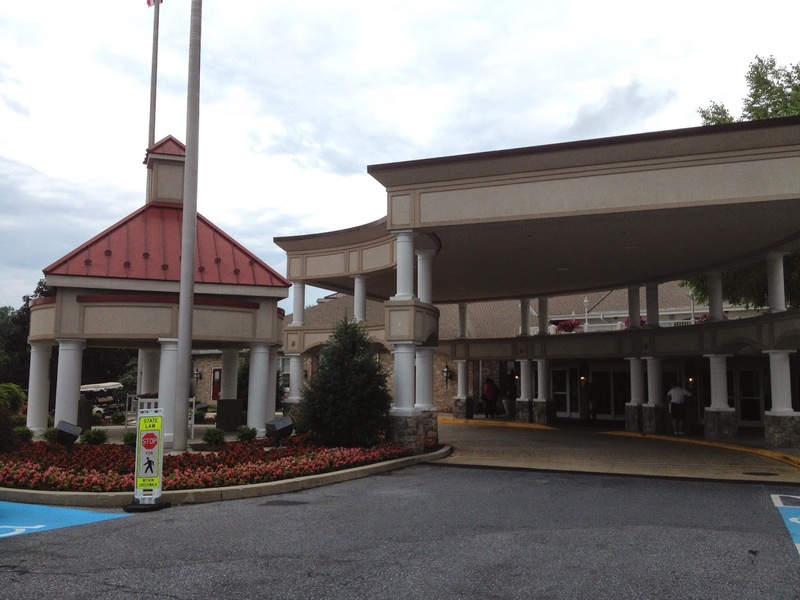 I stayed at Hershey Lodge when I was a kid in the 1970's, but things are very different there now. I remember the Lodge out in an open field with a large lake and sprawling land. The lake, Swan Lake, is still there, but there is a lot built up around it, including hospitals, rehabilitation centers and office buildings. If you're thinking it's going to look like a log cabin or a ski lodge, think again. It's more along the lines of motor lodge, with some of the rooms actually at parking lot level. The lobby has a bit of a lodge feel to it with a stone fireplace and leather chairs, but that's about all I can say as far as 'lodginess.' Check-in was super fast and friendly. They presented us each with a milk chocolate Hershey bar. I was disappointed that the advertised Kids' Check-in Desk was not going to be open till 5pm. 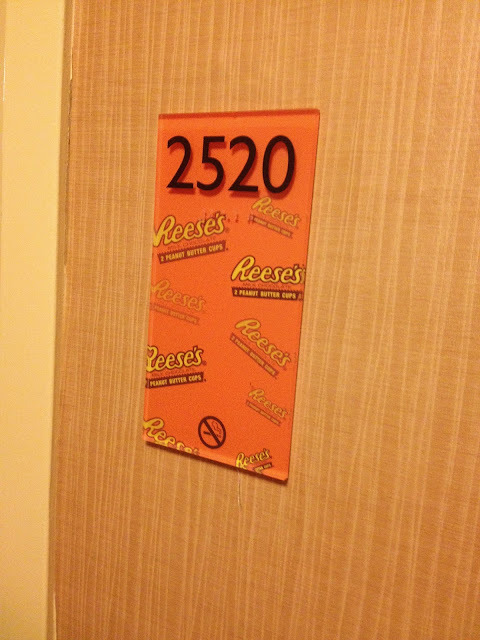 The rooms are situated in buildings named after Hershey candies: Reeses, Peppermint Patty, Kisses, etc. Each building has a letter. 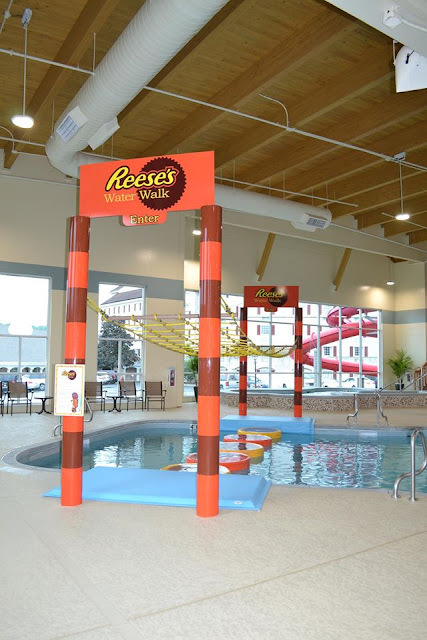 We stayed in the I- Reeses building adjacent to the mini golf course and small outdoor pool. -If you want to get from place to place, it feels like you have to do a lot of walking from building to building. If you're walking outside, you are walking through parking lots. -Not exceptionally pretty, but well kept grounds. -Some of the hallways of the other buildings smelled a little musty, like an old basement (but ours in Reeses smelled ok). When we passed staff in the hallway, most of them did not acknowledge us or even smile, though a few did. We stopped and asked one attendant where the ice machine was and he apologetically said that he did not know, since it was his first day on the job. -Our room was updated and clean. We only stayed one night, but I was disappointed and surprised that there was no turn down service. It was a little deflating to come back from the park and have our room still be in disarray with no new amenities added (and no Hershey Kisses on our pillows- boo!). Was this an oversight or do they really not offer turn-down service? I don't know. -For whatever reason, it was very noisy at night, at least until 11:00pm. There was a lot of banging in the walls which I can't place (staff closets nearby? Clunking of doors within rooms? Not sure) and my husband snored ALL NIGHT LONG (but this is no fault of the Lodge. Ha!). Friends have told me that the food at The Hershey Lodge is more 'kid friendly' as opposed to the Hotel Hershey. This is sort of true. The restaurants at the Hotel Hershey are semi-fancy, but they do cater to kids (offering kid menus, coloring pages, crayons, kid cups, etc.). There seem to be more casual dining options at the Lodge (i.e., you feel comfortable walking into them in shorts and a t-shirt, while the Hotel Hershey restaurants are a tad more upscale). A coffee shop called The Cocoa Beanery offers coffee and some quick breakfasts and sandwiches. There's also Hershey Grill and The Forebay, both of which we skipped because we came upon the other restaurants first. There is The Bear's Den, which we ate dinner at. It's kind of like a sports bar named after the Hershey Bears hockey team. The food was pretty good here, with kid-friendly choices like hot dogs, chicken nuggets and mac and cheese. 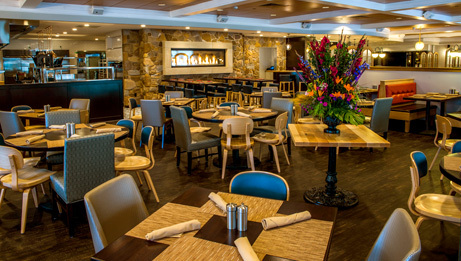 Fire and Grain is a brand new restaurant at Hershey Lodge (as of 2017). It looks really warm and cozy from the pictures and promises an 'innovative dinner and breakfast menu,' so hopefully I'll be able to check it out one of these days! We did not eat at the other restaurants in The Lodge so I can't attest to them. If you have any input about them, please feel free to leave it in the comments section below. 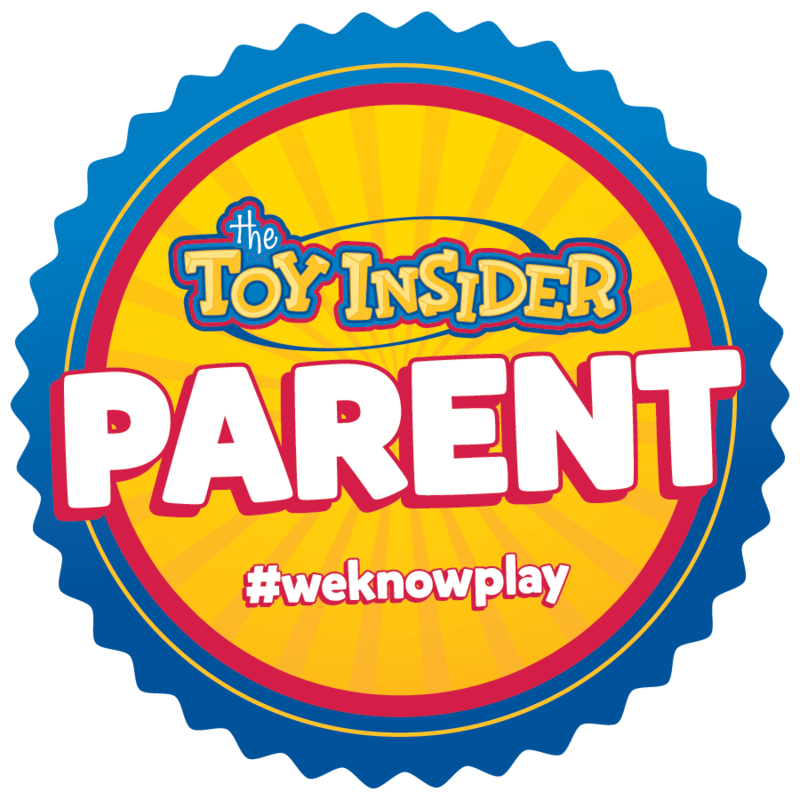 Much like The Hotel Hershey, there's plenty to do here if you have kids. They go out of their way to entertain the young ones, with s'mores roasting, chocolate bingo, and the kids' check-in (which we did visit after 5pm). 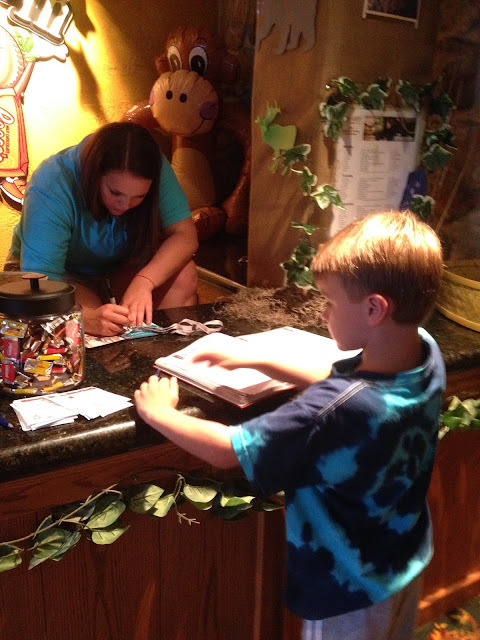 They gave our son a lanyard with his name on it, let him sign the guest book, grab a piece of free chocolate, and take a guess at the candy jar giveaway (see what I mean about getting a full 'park experience?'). There's a Wii room (which we did not use, just peeked in), a game room and mini golf, all free with your room stay. 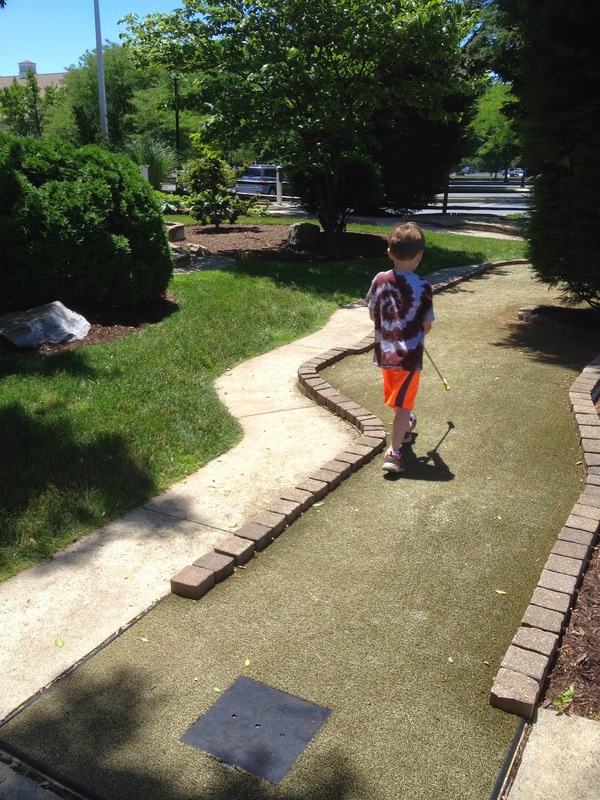 We did play mini golf, and it was a well-kept, cute little course. But something made me feel that some of the buildings needed renovation. The Wii building was small and looked a little old to me inside, as did the game room. I suppose this is not something that would bother kids at all, so you have to decide what matters to you as a family. 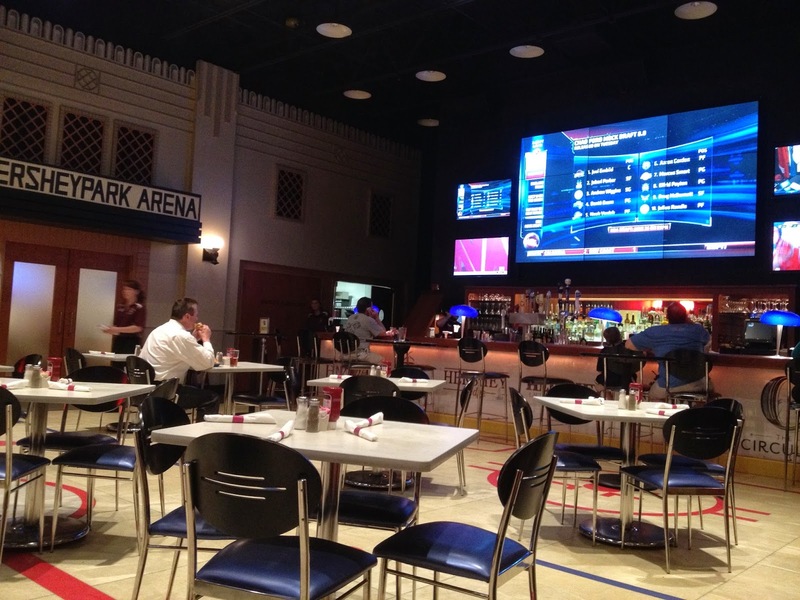 There are basketball courts, shuffleboard courts and tennis available, too. You can also check out their fitness center. 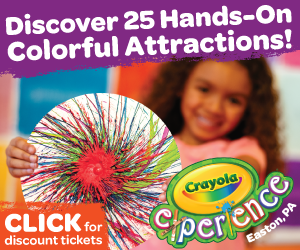 There are plenty of excursions and activities for purchase (just like the Hotel Hershey). From Segway tours to Falconry experiences. 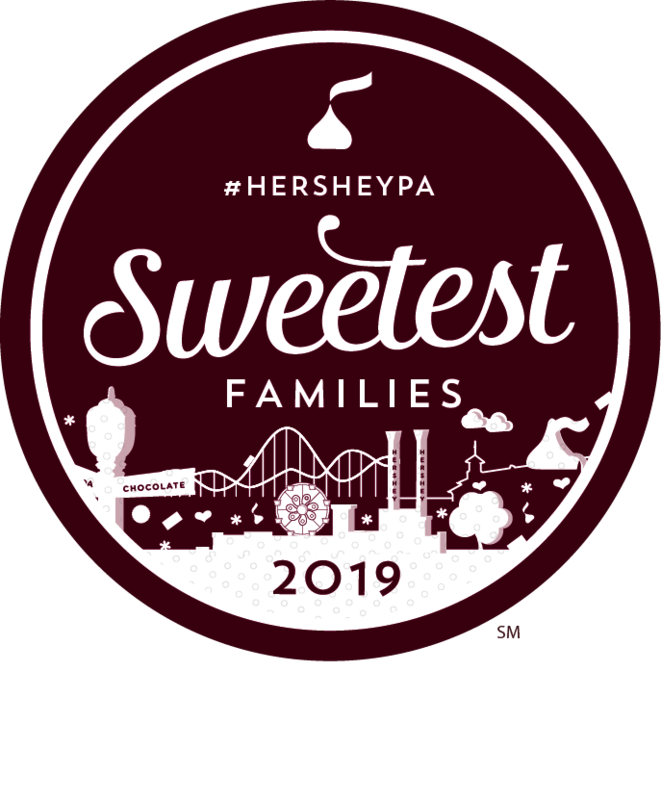 NOTE ABOUT THE ACTIVITIES AT HERSHEY LODGE: It is worth mentioning that many of the activities at the Lodge are FREE as opposed to the Hotel Hershey. The Hotel Hershey charges a small fee for use of their putting green and the Lodge does not. There is a free playground at the Lodge while you can only use the playground at the Hershey Hotel as part of the paid Cocoa Kids Club care center. Oh, another neat tidbit is that you can see the Hershey Kiss factory from the mini golf course. 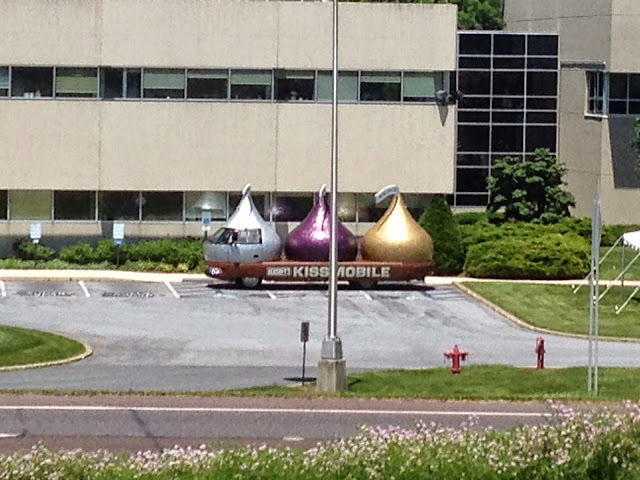 We spotted the Hershey Kissmobile parked outside (you can visit the Kissmobile most days at the AACA Museum in Hershey, too). So cool! -There is one outdoor pool and one indoor pool/waterworks area (see info below or check out their website). -The outdoor pool next to the mini golf course was small but looked clean. However, it also appeared to be closed. When we inquired about it at the mini golf stand the girl working there said, 'No, it's open. Is it closed? It's not supposed to be closed. Is there a lifeguard there? We can call someone if you want to use it and they can come down.' That all seems well and good, but it was just odd to me that the pool was locked and closed when it was supposed to be open? In May of 2016, Hershey Lodge opened Hershey's Water Works and features a giant Twizzlers slide and Reese's Water Walk for kids, all indoors! Read all about it on their website. You can order food at these outdoor/indoor pools at Cocoa Cabana, which was not there when we visited, so I can't attest to the food. Feel free to add thoughts to the comments section of you have eaten there! -Guests of the Lodge can take a complimentary shuttle to and from Hersheypark and Chocolate World. If you want to go to Hershey Gardens or the Hotel Hershey, you have to pick up another shuttle once you get to the park. At the Hotel Hershey, the shuttles go directly to the Gardens and the park with no transfer shuttles needed. -The shuttles arrived and departed quickly, and the drivers were super friendly. They even offered up some Hershey trivia during the drive. Buses were clean, comfy and air conditioned. -The drive from The Lodge to the park (and vice versa) is significantly longer than it is from the Hotel Hershey. It took us a little over ten minutes to get to the park in the morning from The Hershey Lodge, but the return ride took about 15 minutes or a little more. The Hotel Hershey is a lot closer to the parks so you can get in/out a little quicker. The Hotel Hershey is also right across from Hershey Gardens, so you don't have to change any shuttles, and you can even walk to the Gardens if you desired. - The shuttle drops you off right at the entrance to Hersheypark. You can't beat that! The park and Chocolate World are right across from each other, so you can walk to either quite easily and quickly. The shuttles run consistently throughout the day, as well as at night so you never have to worry about being left behind. That is one of the biggest perks about staying at the Hershey resorts. Off-season, the shuttle service varies, so be sure to ask ahead if you'll be staying off-season. Be sure to check out part 2 of my blog review, where I compare the Lodge to the Hotel Hershey. Which one is better? Which one is worth the price? Read Part 2 to find out! Oh my gosh, I am so excited to see this post!! We have a vacation planned for the end of summer, but I was trying to think of somewhere else to go just for a couple days in May or June. I had never even thought of Hershey Park! I went there loooong ago and I really don't even remember it. I didn't know they had Hershey hotels! I am totally looking into this! Awesome!! Hershey is soooo much fun. It's one of our favorite places and there is so much to do there. Just be sure to check on Hershey Park's operation dates if you go in May. The park is usually only open on weekends then (the full summer season usually starts at the end of May). Thanks for stopping by! I have always wanted to visit the park. This is such great info on the hotels, it would make choosing much easier. I love themed parks and hotels. Good to know! I'm always interested in hotel reviews - especially since it's your own opinion! Very cool! I have always wanted to travel to Hershey! How fun! I really like the candy decorated room numbers, nerdy things like that are totally my thing, hahaha! It's such a great place! Definitely worth the trip, no matter which hotel you choose! Thanks for stopping by, Jules! I love One Ruud Mom! Hi The Jersey Momma - We're staying at the hershey Lodge for the 1st time next week. Do you recommend a room in a specific part of the hotel? Main building? In one of the 'wings' building? Inside or outside entrance? I'm traveling w/ two 11 yr olds so walking, having toddlers, etc. isn't an issue. Thanks! Hi JoJo, the wing we stayed in (Reese's "I" wing) wasn't bad and was only a short walk to shuttle, main lobby, etc. It was also fairly quiet, too. If you haven't made reservations yet, it might be worth asking if any of their wings have been recently renovated, because that might be a nice plus, to have a newer room! I hope that helps. Have fun!! You are very welcome. Thanks for reading it! Great blog! Going to stop for a night in August and your info is very helpful! Just wish the Hotel was a little less expensive!! I know, I agree! Or I wish they had more specials or discounts. AAA or off-season seem to be the best bets for a better rate there. Thanks for stopping by and reading my post! Hi Marissa! Thanks for your question. I have not been to the Lodge since Waterworks was added so I'm not certain about the outdoor pool. 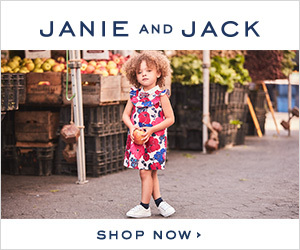 Their website still lists a splash pad and zero entry outdoor pool so my guess is that they still have some kind of outdoor water area for the kids. You'll have to let me know for sure! Have fun on your trip!! Thanks so much for this review! We checked out the Hershey Hotel not knowing they even had a lodge! We have 4 children 9-13. I think the lodge may be more kid friendly! We can save the hotel for romantic get-always! Thanks again! Yes it sounds like the Lodge might be more up your alley! Especially if you go in the winter months or when you want to use the indoor pool. The Hershey Lodge Water Works is a fun area for kids of any age! Thanks for reading and commenting.